Ackerman Chiropractic offers a vast array of services that will help alleviate your various conditions. We know that everyone is unique and because of this we can provide a specific plan to meet your clinical goals. Below are just a few tools that we utilize. Chiropractic joint manipulation (adjusting) is a hands on manual therapy that is focused on restoring proper motion to restricted joints of the spine and extremities. A joint complex will become restricted due to an injury, improper posture and muscle imbalance, just to name a few examples. Improper motion of a joint will affect all the nearby joints, and could lead to degeneration, poor function and pain. The adjustment will restore proper motion and function in a manner that cannot be done on your own even with exercise and corrected posture. Chiropractic adjustments also act as a natural pain killer, relaxes tight muscles and most importantly restores proper function . Dr. Mike and Dr. Justin Ackerman will use Diversified, Gonstead, and Motion Palpation adjustments, depending on what each individual patient needs. Soft tissue treatments are an equally important part of the healing process. A restricted joint and tight muscles do not occur independently to one another, when there is one, there is the other. Soft tissue techniques are used when fascia, muscle, ligaments, or tendons are hypertonic, painful, and do not work properly. Both Dr. Mike and Dr. Justin Ackerman have extensive knowledge and training in myofascial release, trigger point therapy and Nimmo ReceptorTonus. Dr. Justin additionally is a Grason Technique®trained practitioner. The most important tool for good health is the knowledge and know how to not let an avoidable injury occur again in the future. Not only will the Doctors at Ackerman Chiropractic find your functional limitations, we will create a specific program that will enable you to work towards your goals while outside of the office. We will prescribe the best, most effective therapeutic exercises that will stabilize your condition. Electrical stimulation is an excellent method to decrease pain, muscle spasm, edema, and stimulate healing. 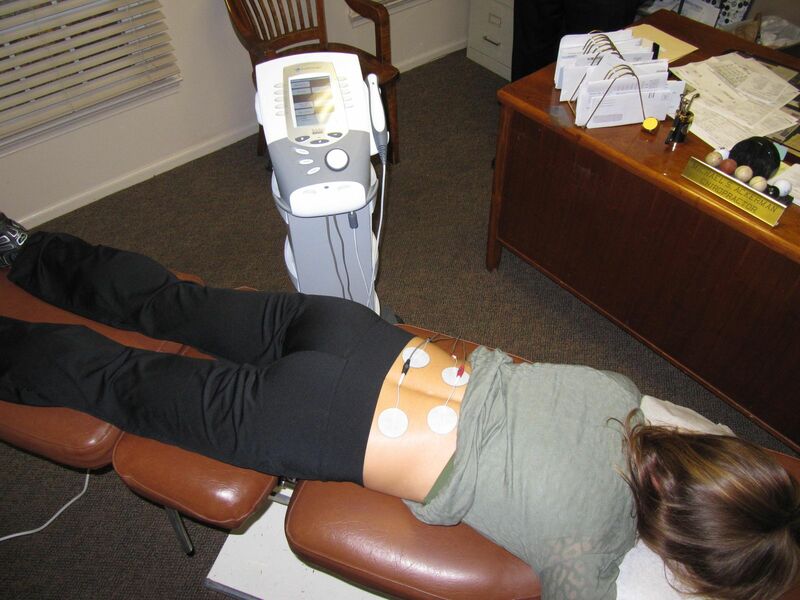 At Ackerman Chiropractic we offer six different types of electric stimulation. Depending on the current, parameters and intensity there will be a specific physiological effect for you. Therapeutic ultrasound is a type of therapy that is used by most chiropractors. Ultrasound waves can be controlled by the clinician to treat various structures in the patient. The waves themselves are not felt by the patient, however they can be specific to treating the joint capsule, surrounding muscles, ligaments, tendons and scar tissue. The waves will help stimulate the various collagen and fibrous tissue to promote healing and reduce the time of the inflammatory process, leading to a faster and more complete healing. We provide spinal correction utilizing gentle chiropractic techniques. Never in the history of chiropractic have we been able to provide the level of help and expertise that now exists. These newer correction methods are even safer, more comfortable and more effective than ever before. As a Doctor of Chiropractic, Dr. Michael Ackerman has years of training and experience in spinal adjustment.